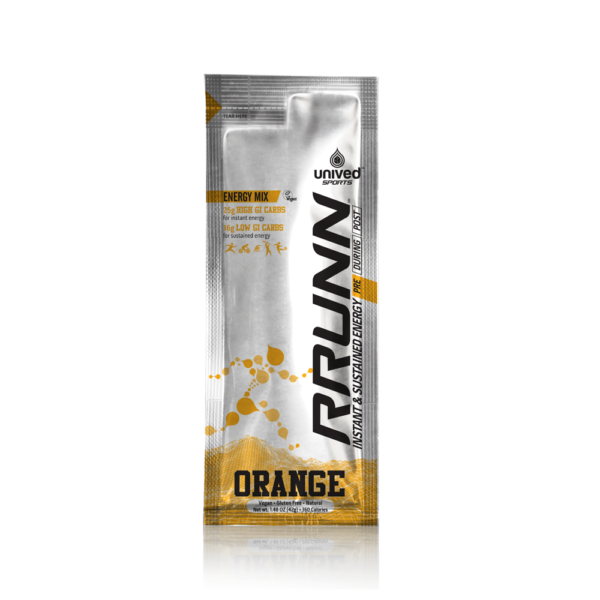 RRUNN™ Pre is a pre-workout energy mix with a blend of simple and complex, high-glycemic and low-glycemic carbohydrates. By consuming RRUNN™ Pre 15 minutes prior to your run, you have instant energy for a great start, and sustained, slow release of energy that stays with you for the long haul. Available in orange, watermelon, and green tea (caffeinated) flavour. 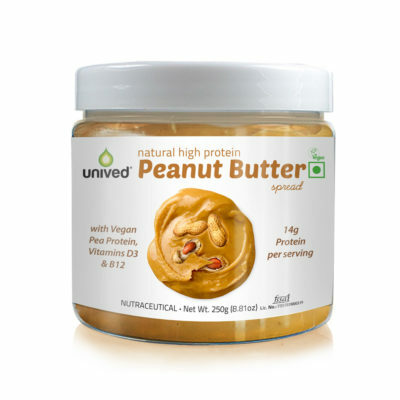 No artificial colours, no preservatives, natural, gluten-free, and vegan. It’s 15 minutes before your endurance activity, your body needs enough energy to give you both, a confident start and sustained momentum. While a single source pre-workout energy mix of instant energy can propel you at the beginning, if it’s not combined with a sustained energy source, you will soon start to experience spiking and dropping. This can wear you down physically, impact your mental stamina and adversely affect your performance. Adequate amounts of carbohydrates in the system can avoid these highs and lows, and ensure that once you start, you don’t slow down. 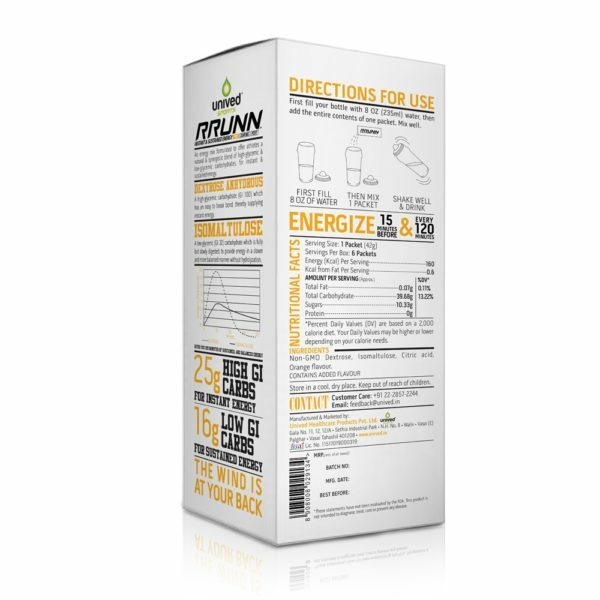 RRUNN™ Pre is a blend of simple and complex, high-glycemic and low-glycemic carbohydrates. Dextrose in RRUNN™ Pre is a 100 GI high-glycemic carbohydrate. 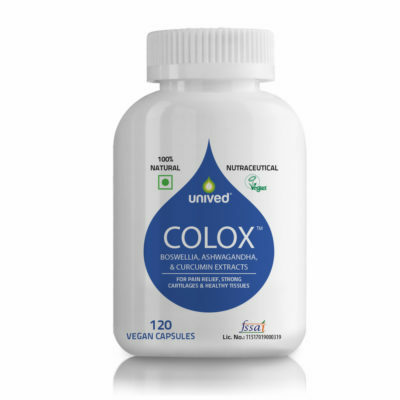 It is easily digestible, breaks down quickly and is rapidly absorbed by the body – giving you the instant burst of energy you need at the crucial beginning stages of your activity. 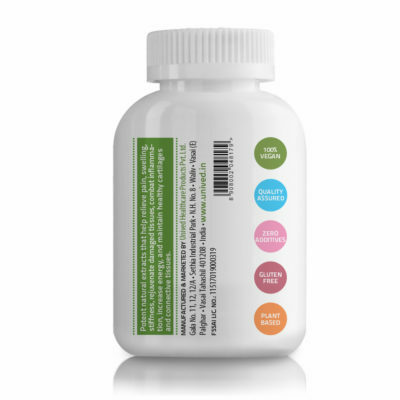 Isomaltulose is a 32GI low-glycemic carbohydrate which is difficult to break down. Isomaltulose releases energy in a gradual, more prolonged manner and this energy lasts for up to 120 minutes of your activity. The 32GI carbohydrate also that ensures your body’s own carbohydrate stores don’t get used up too early, so you can tap into this precious energy source when you need it the most in the later stages of your endurance activity. These carbohydrates are non-competing and synergistic. 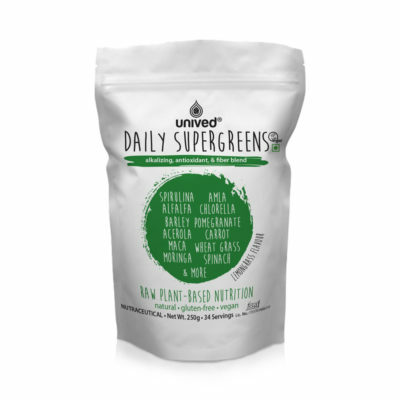 Once you have raced through the surge of instant energy from the high GI carbohydrate, the low GI carb kicks in with the sustained energy support – helping you to maintain your head-start. 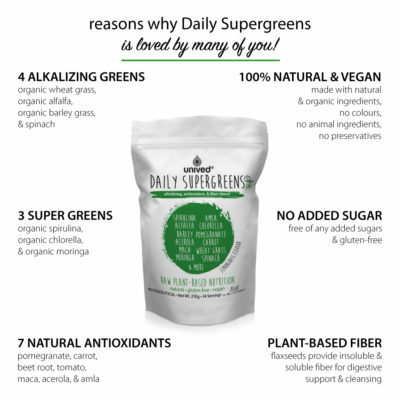 You don’t experience a lag between the instant and sustained energy support, which means no sugar spikes and no ‘crashing’. These synergistic carbohydrates help you surge ahead, and once you achieve your peak, they help you stay on top without dropping. 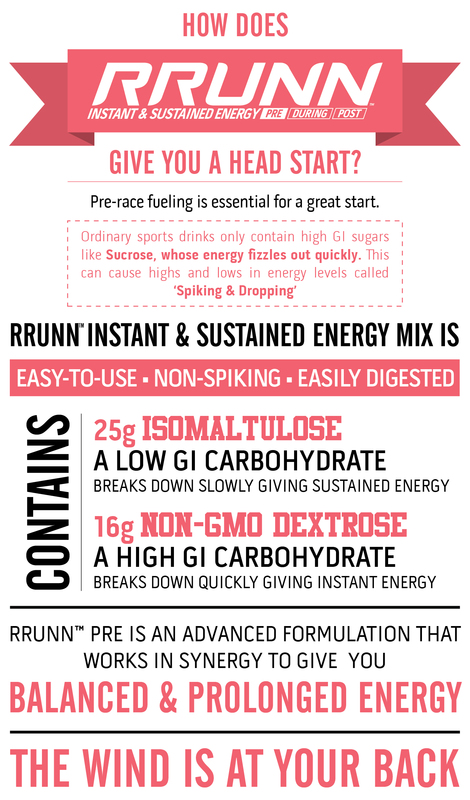 Who should use RRUNN™ Pre – Pre-Workout Energy Mix? RRUNN™ Pre is suitable for athletes of all ages, and across all endurance sports such as running, cycling, football, cricket, hockey, swimming, as well as demanding competitions such as marathons, ultra-marathons, cycling, and other activities that test your physical and mental strength. Take 1 serving in 235ml (8 oz) of water, 15 minutes prior to starting your activity. 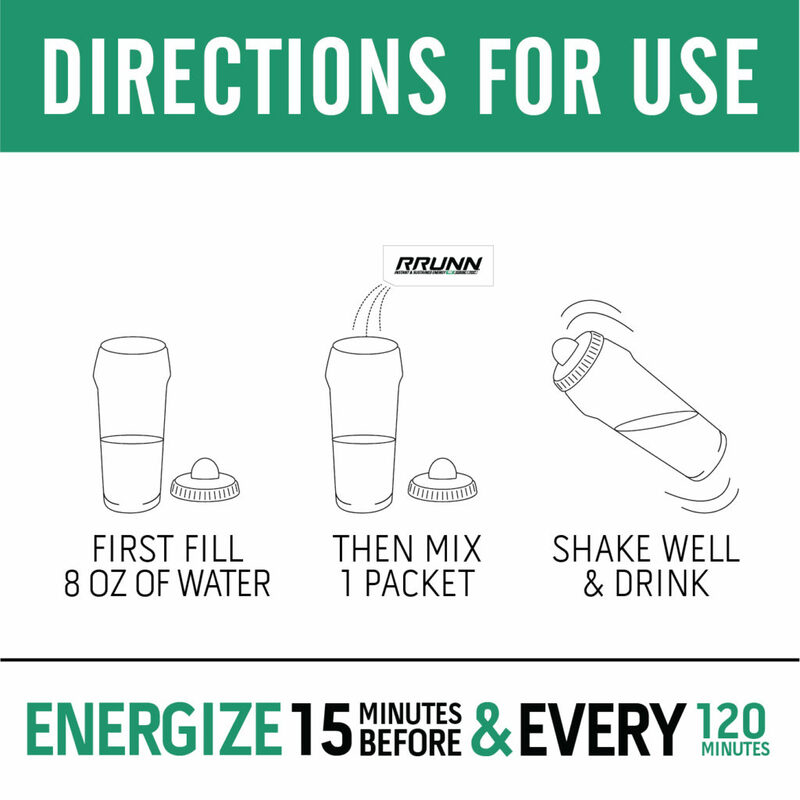 You can repeat 1 serving of RRUNN™ Pre after every 120 minutes. 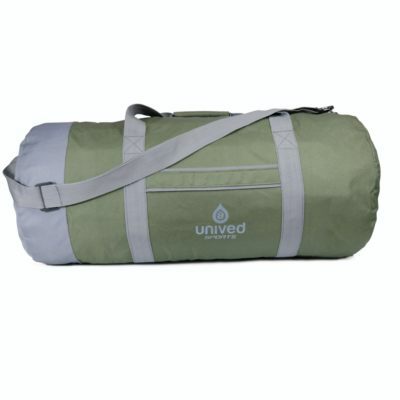 This is highly recommended for anyone doing an endurance activity over 4 hrs. The RRUNN™ range adheres to the WADA (World Anti-Doping Agency) guidelines, and the products do not contain any banned substances. However, please note that WADA does not offer any certification or written confirmation of the same. 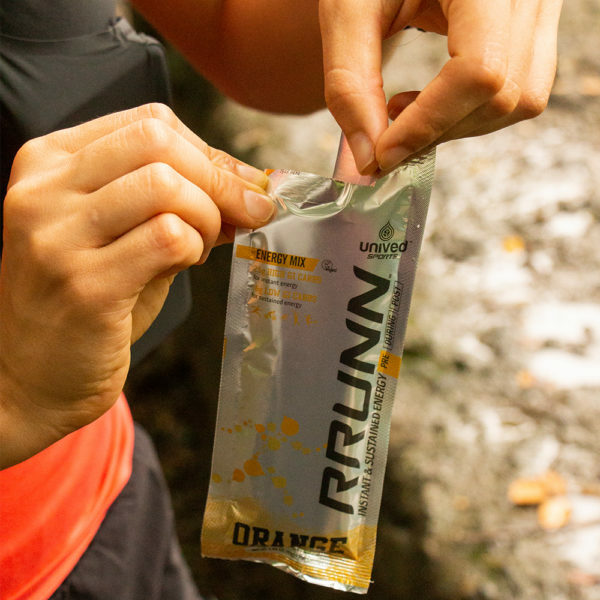 RRUNN™ Pre is part of the RRUNN™ System, along with RRUNN™ During – Hydration & Endurance and RRUNN™ Post – Complete System Recovery. 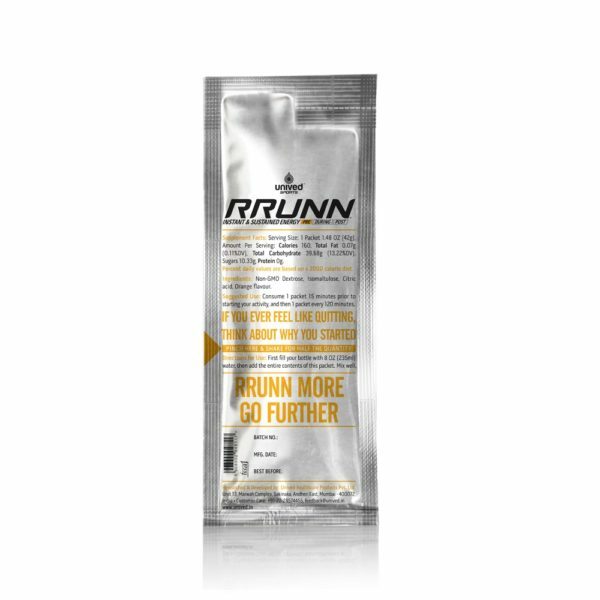 The three formulations of RRUNN™ – Pre, During and Post – are each scientifically calibrated to supply carbohydrates, electrolytes, endurance, & recovery supplementation to address the physical, mental, and physiological requirements of an athlete during every stage of an endurance activity. You can also incorporate RRUNN™ Endurance Energy Gel and RRUNN™ Electrolyte Salt Caps into your regimen. When performances peak, passions soar, recreational sports turn competitive, and athletes become professionals. With RRUNN™ , the wind is at your back. 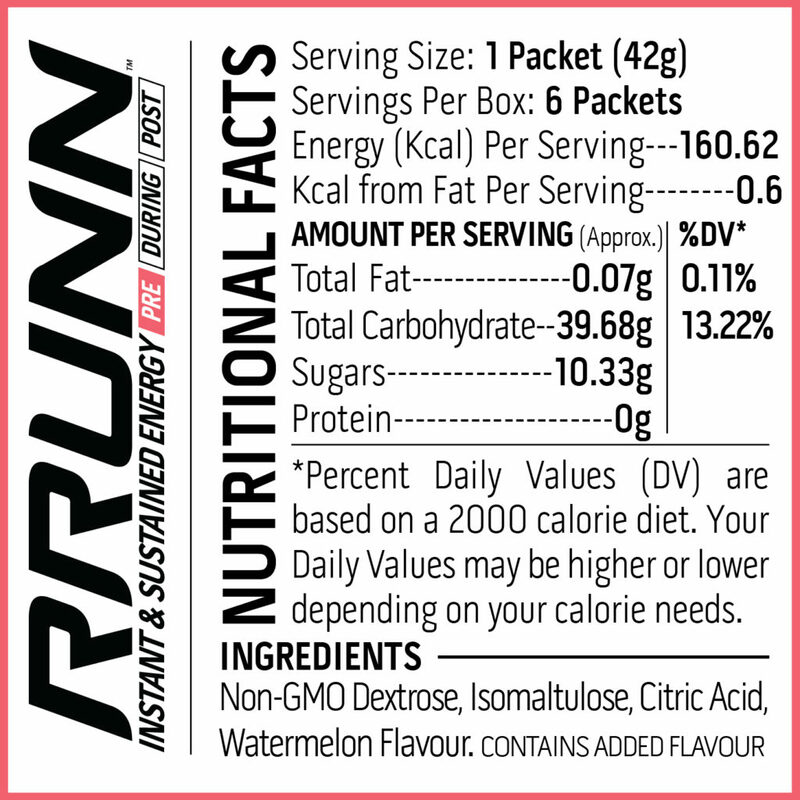 What carbohydrates are in RRUNN™ Pre? RRUNN™ Pre is a blend of Dextrose, a simple, high GI carbohydrate and Isomaltulose, a complex low GI carbohydrate. 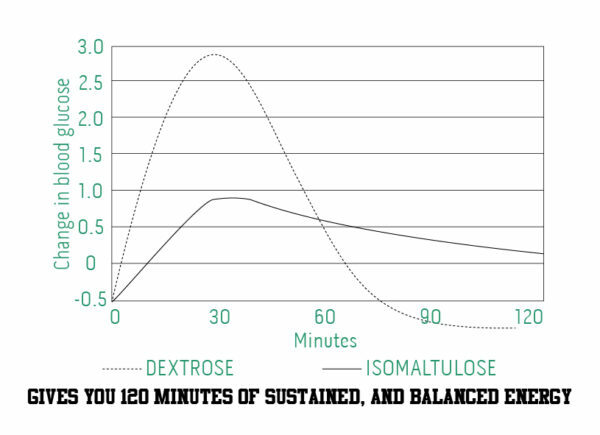 Dextrose supplies you with instant energy, while Isomaltulose is a source of slower, more sustained energy. Why is RRUNN™ Pre superior to other pre-workout energy drinks? Most other energy sports drinks only provide a high GI carbohydrate of 100, which means it only supplies instant energy, and not sustained energy. RRUNN™’s blend of high GI and low GI carbohydrates gives you both – instant energy, and long lasting energy, making it the ideal pre-workout energy mix. 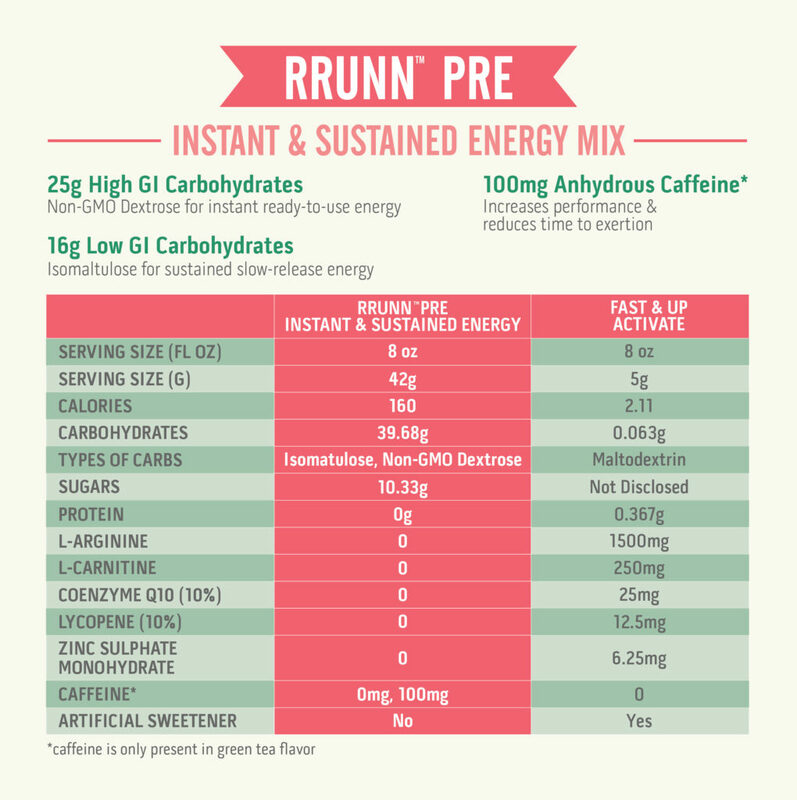 When do I consume RRUNN™ Pre – Pre-Workout Energy Mix? 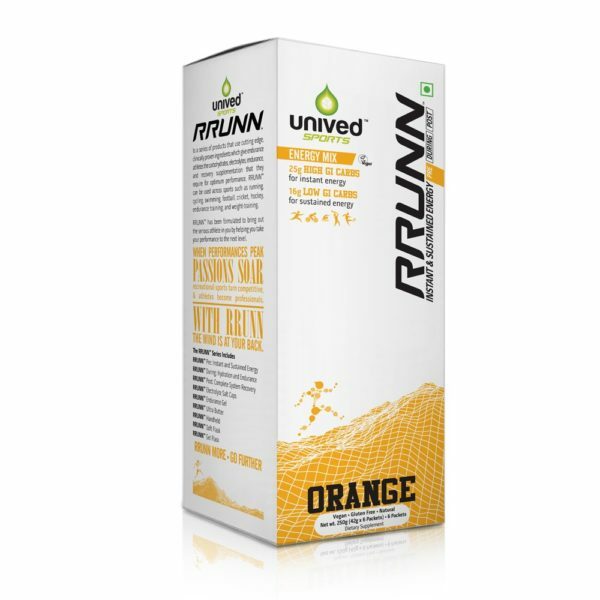 RRUNN™ Pre should ideally be consumed 15 minutes before a run or any other endurance activity. 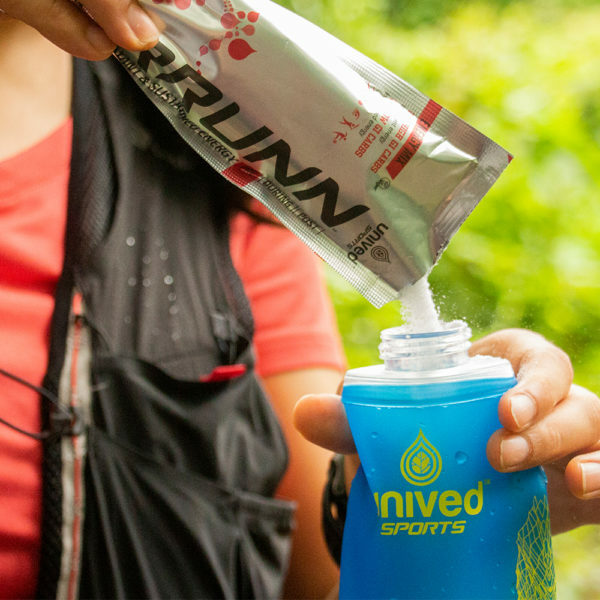 One serving of RRUNN™ Pre in 235ml of water should give you plenty of instant energy and sustained energy to last you for up to 120 minutes of your endurance activity. You can opt to take 1 serving of RRUNN™ Pre after every 120 minutes. This is particularly recommended for anyone doing a triathlon, ultra, full marathon, or any other endurance activity lasting over 4 hours. Can I incorporate RRUNN™ Pre into my training? Yes! In fact, we recommend that you do, so your body can acclimatize to it and you get the best results from RRUNN™ Pre on race day. Is RRUNN™ Pre suitable for vegans? Yes. RRUNN™ Pre – pre-workout energy mix is suitable for vegans and it is certified vegan by the Vegan society, UK. 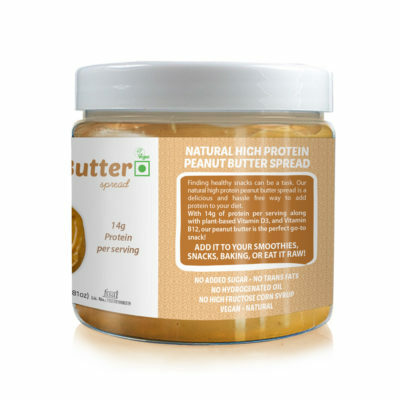 We do not use animal ingredients and our products are not tested on animals. Who should consume RRUNN™ Pre? 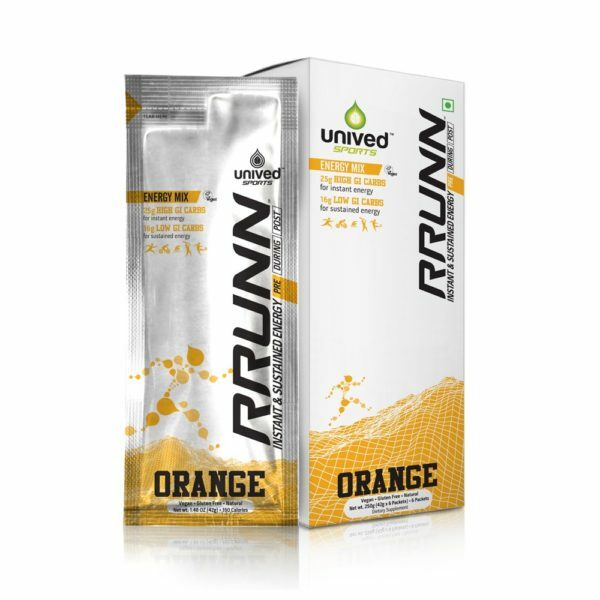 RRUNN™ Pre – pre-workout energy mix is suitable for athletes of all ages, and across all endurance sports such as running, cycling, football, cricket, hockey, swimming, as well as demanding competitions such as marathons, ultra-marathons, long-distance running, triathlon, and other activities that test your physical and mental strength. 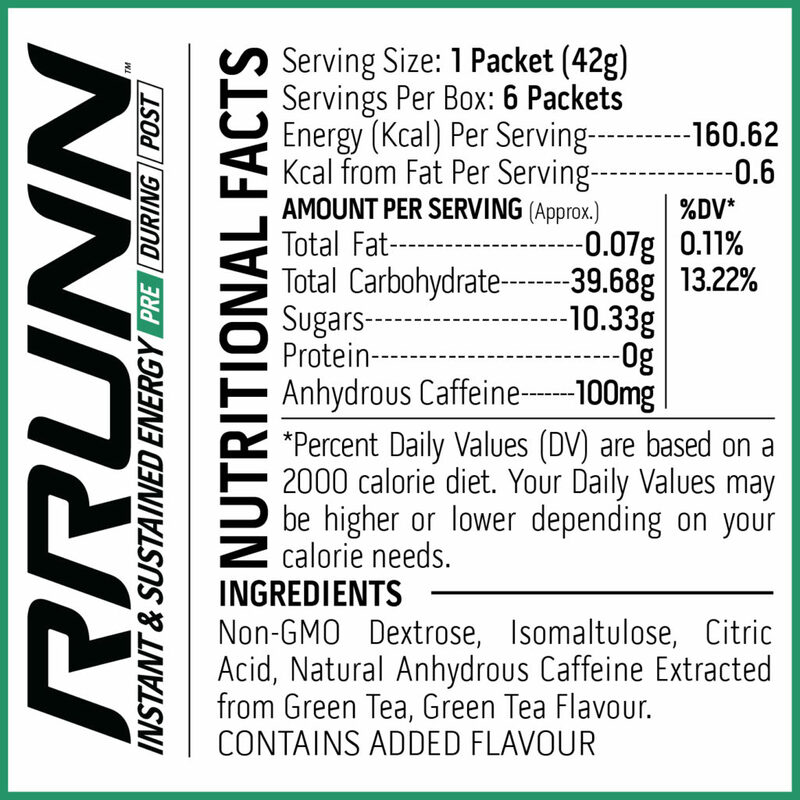 Does RRUNN™ Pre contain caffeine? We do have an option that has 100mg of caffeine. You can opt to buy our RRUNN™ Pre Green Tea Flavor if you prefer a caffeinated option. 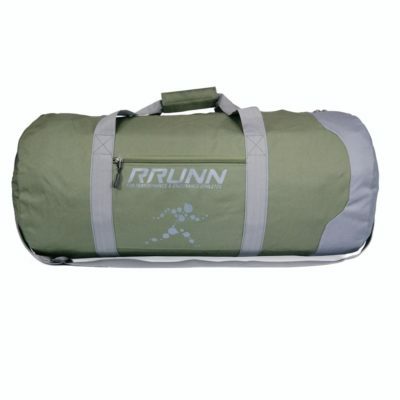 Does RRUNN™ Pre contain any banned substances? As the RRUNN™ range has been formulated in accordance with the WADA (World Anti-Doping Agency) guidelines, RRUNN™ Pre does not contain any banned substances. However, please note that WADA does not offer any certification or written confirmation of the same. 1. Achten, Juul, Roy L. Jentjens, Fred Brouns, and Asker E. Jeukendrup. “Exogenous oxidation of isomaltulose is lower than that of sucrose during exercise in men.” The Journal of nutrition 137, no. 5 (2007): 1143-1148. 2. Brouns, Fredericus Johannes, and Jacques Georges Simon. “Isomaltulose or trehalose containing comestibles for sustained carbohydrate energy release and increased fat oxidation.” U.S. Patent Application 10/565,367, filed July 16, 2004. 3. Currell, Kevin, and Asker Jeukendrup. “Superior endurance performance with ingestion of multiple transportable carbohydrates.” Medicine+ Science in Sports+ Exercise 40, no. 2 (2008): 275.